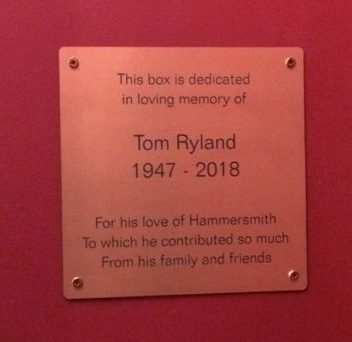 As one of the ways in which The Hammersmith Society will be commemorating Tom, we plan to erect a bench dedicated to him at a location along the Hammersmith riverside. We know that among the members of the Society there were personal friends of Tom’s, and if you would like to make a donation to the cost of the bench, do please contact Melanie Whitlock (ku.gr1556165831o.yte1556165831icosh1556165831timsr1556165831emmah1556165831@namr1556165831iahc.1556165831eciv1556165831). The Lyric reopened in October after a 3 1/2-month, £780,000 refurbishment. The Main House auditorium was entirely repainted, with plaster-work repaired, and seats replaced. The original theatre was designed by Frank Matcham and opened in 1895, but was demolished as part of the redevelopment of King Street in the 1970s. After a campaign led by the Hammersmith Society much of the fabric was preserved and used in the rebuilt theatre. It was reopened in 1979 and this is the first refurbishment of the Main house and Studio since then, though the major additions and extension to the Lyric, designed by Rick Mather Architects, opened in 2015. We are so lucky to have this theatre on our doorstep – do take the opportunity to go to the Lyric and enjoy its restored splendour.